Rainbow District School Board today launched the Joan Mantle Music Trust as Councillor Doug Craig, on behalf of Mayor John Rodriguez, declared November 24th to 30th Music Appreciation Week in the City of Greater Sudbury. 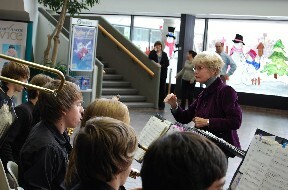 Joan Mantle, founding music teacher at Lo-Ellen Park Secondary School, welcomed the opportunity to direct the Lo-Ellen Park Secondary School Senior Jazz Band. The band will perform at the school’s Swing Soirée on Saturday, November 29th. Rainbow District School Board today launched the Joan Mantle Music Trust as Greater Sudbury Mayor John Rodriguez declared November 24th to 30th Music Appreciation Week in the City of Greater Sudbury. The week will culminate with Lo-Ellen Park Secondary School’s Swing Soirée Dinner and Dance on Saturday, November 29th. This year’s event will celebrate long-time educator Joan Mantle with the inauguration of the trust being named in her honour. Citizens are invited to donate to the trust in the form of bequests, cash and/or cheques or new musical instruments. Rainbow District School Board will issue receipts for income tax purposes. Lo-Ellen Park Secondary School, which has spearheaded the creation of the Joan Mantle Music Trust, will be the first to benefit. Joan Mantle was the founding music teacher at the school some 40 years ago. As the trust grows, other Rainbow secondary schools will reap the rewards of Sudbury’s generosity. The Joan Mantle Music Trust will allocate funds to secondary school music programs in Rainbow District School Board, one school at a time. This will ensure that there is a tangible improvement in the condition of equipment in an entire department, allowing for students to achieve more in their musical studies together. 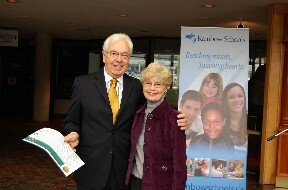 Joan Mantle has dedicated many years to music education in Rainbow Schools. When she joined the Sudbury Board of Education in 1964 to teach math and science at Lo-Ellen Park Secondary School, Principal Bruce Elliot, who was aware of her extensive background in music, invited her to establish a music program at the school. She gladly accepted and planted the seeds for what continues to be a hallmark of education at Lo-Ellen Park Secondary School. Since retiring in 2003, Joan has continued to serve our community on many boards. In 2007, she was Chair of the Board of Governors at Cambrian College. For her contribution to music and the arts over a long and successful career in education, it is certainly fitting that Joan Mantle be named patron of a trust in support of music education throughout the Rainbow District School Board’s secondary schools. Established in 1989, the Swing Soirée has become an annual tradition at Lo-Ellen Park Secondary School. Organized by students from Lo-Ellen Park’s music department, this event raises funds for students to participate in the yearly band trip. The school gym is turned into a Christmas wonderland and the dance features the festive sounds of the Lo-Ellen Park Secondary School Senior Jazz Band. Tickets to the Lo-Ellen Park Secondary School Swing Soirée Dinner and Dance are $35 single, $60 a couple, $240 for a table of eight, and $300 for a table of 10. Tickets are available from the Lo-Ellen Park Secondary School Office on Loach’s Road and the Sudbury Theatre Centre Box Office on Shaughnessy Street. Those who attend the Swing Soirée will have an opportunity to be among the first to make a contribution to the Joan Mantle Music Trust. The Rainbow District School Board provides students with opportunities to increase their musical literacy and develop their creative and critical thinking skills by engaging them in activities that lead them to learn in, about and through music. Musical literacy is the ability to read, write, create and perform music, as well as analyze, interpret and appreciate music from a variety of cultures and historical periods. Learning in, about and through music is part of a well-rounded education that reinforces academic skills and nurtures life skills. Learning songs and rhythms develops literacy skills. Connecting songs, language and movement increases thinking. Music improves self-esteem and confidence and promotes teamwork and an overall appreciation of the arts.